Chris Barker the first to wear the Jacket, Silly Hat and Wig All at Once. After just one week it was back to Pattavia for another try at taming those greens. However, the Greenkeeper had done the job for us as some maintenance had slowed things down. This caused some confusion as we were still too scared on the downhills, unnecessarily as it turned out. Weather was pleasant as the first three-ball of our 11 groups teed off behind a large group from another Society. It looked like a slow day ahead, and it was. We did get away on time with the help of the Marshal who is very good here. In the “A” flight (0-17) it was a three-way countback on 34 points to sort the placings which resulted in Stu Thompson taking the top spot ahead of Chris Barker and Tommy Marshall in third. Then another countback on 33 points saw Masa Takano sneak in ahead of Ray Banks. It was cut and dried for the first three places in “B” flight (18+) with Tony Browne having an easy victory, scoring a great 40 points on a difficult day. He must have been on the simulator again. Bart Bingham took second with 38 points and Torben Lindgaard third on 36 points. One more countback to settle fourth place where Greg Thompson got the nod over Ian Collier, both with 35 points. Near Pins: Bill Shepley (4), Russell Exley (7), Maurice Roberts (13), Bill Copeland (17). Best Back Nine (non winners) – Richard Dobson …22 pts. 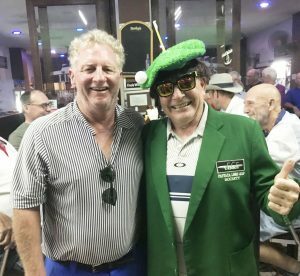 Stu Thompson almost wore the “silly hat” due to a richocheting ball hitting a tree and a caddie, but not enough.The player with the worst score didn’t make it back to the bar, nor did Tony Browne to get the Green Jacket. Chris Barker came back on the first bus and sat quietly for more than an hour. All the places sorted, envelopes written and then Maurice and Len discovered one card missing. When identified, he handed over the card and it turned out Chris had a winning score. So, because all the prizes in “A” flight had to be re done, THAT deserved the “silly hat”. With neither Tony or the “wig” winner present, Phil decided Chris could wear the lot. First time ever that’s happened.